It is a process of the ocean floor plunging back into the interior of the Earth. Older ocean floor is pushed away from the midocean ridges as new ocean floor is formed. 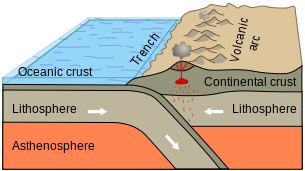 It is believed by the scientists that the older ocean floor is then pushed down deep into the earth along the trenches. This process is Subduction.